Our pic for today revisits Barney’s Beanery and Bert, purveyor of the best chili in town. It’s from the very first Columbo episode, “Ransom for a Dead Man,” which debuted on March 1, 1971. 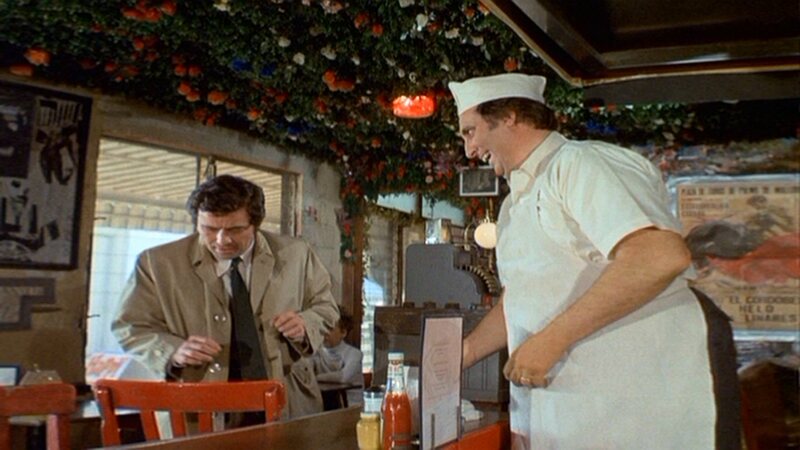 Columbo (Peter Falk) knew he could always count on a bowl of Bert’s chili to help clear his brain and help him think better. As the 1960s progressed, Timothy gained quite a bit of weight; we’re seeing him here at probably his heaviest. Throughout the 1970s and 80s he steadily slimmed down. As his health took a turn for the worse in the late 1980s, however, he began to look alarmingly thin. But his spirit remained indomitable. This entry was posted in Television and tagged barney's beanery, columbo, peter falk, ransom for a dead man, timothy carey. Bookmark the permalink.